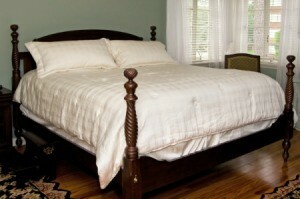 Should your down comforter develop an odor, there are a few ways you might consider for cleaning it. This is a guide about removing odors from a down comforter. Last winter I bought a king size down comforter, it is dry clean only. When I took it out (I stored it in the duvet cover in a plastic bag that a blanket comes in) it smelled like maybe feathers. I didn't like the way it smelled. My sister said I could wash it at the laundromat. I took it there and washed it in a large machine. I dried it there also for maybe an hour and a half. Now it smells different and even worse. It smelled up my whole house. This was last night, I put it in my dryer for another hour, but it still smells and so does my dryer. What can I do? Is it ruined? No, I don't believe you ruined it. I advise that you have it professionally dry cleaned. Let them know that the comforter has an odor, and ask if they can remove it. When you dried it, did you put a shoe in with it? This is necessary to unclump the feathers and spread them around evenly. If there are clumps of wet feathers still gathered together, the odor will remain. I had a down coat, and it was machine washable and with a shoe in the drier it fluffed back up nicely with on odor. Everything with feathers takes much longer to dry than you think. Wet feathers smell pretty bad. I suggest you keep drying it with tennis balls or a clean sneaker to fluff up the feathers so they will not clump together. Maybe add some dryer sheets as well for a better scent. Before taking the comforter out, "pinch" deep into the feathers. Do they still feel moist or cold? If so, keep drying it! I agree that the feathers probably did not fully dry. I suggest you re-wash it and plan on putting it through several dryer cycles. Instead of sitting at the laundromat, maybe a friend would let you use their dryer in exchange for some light housekeeping. The down comforter I bought came with that animal smell. The ad description said the down was cleaned and treated to be hypo allergenic. I wonder if treated down would smell this bad. I am very close to returning this. I know how to launder down, but I'm not sure it is ok for this one to smell so bad. When aggressively washing down comforter like I've read on some sites, trying to get rid of the odor, be careful not to wash away the coating on the down which is part of its warmth-making. I don't see how adding vinegar etc. could be a safe thing to do, only a woolite type product and cold water and cool drying for a long time, followed by airing out and feeling for clumps as a previous poster said. Don't let there be clumps! I have always just set them out in the sun to air out. This works especially well if you have cedar trees! I have goose feathered down duvet. I wanted to put it outside to air out, but it was raining. So instead I put it in the dryer. I never washed it, just the dryer and now it smells burnt. What do I do? I love my comforter, but I think I ruined it. I have a comforter with feathers in it and I wash it all the time. The feathers should not be hurt by washing them. It smells anyway, so go ahead and wash it in the gentle cycle. Then dry it and I think you will find you are happy with the results! If it is so big you have to stuff it in the machine and there is no room around it, you might like to take it to a laundromat where they have bigger washers. I had never heard of using tennis balls and if the down sometimes smells until it is completely dry from the dryer. It sounds like your dryer may get too hot for the down. The comforter can be washed in warm water with regular detergent in a washing machine. I would try 1/3 cup of borax with the detergent to get rid of odors. If you dryer has a low setting dry the comforter in the dryer. It will take more than a couple times thru to get the down dry. If your dryer gets quite hot try a laundromat where you can dry on a low heat setting. Good Luck! The comforter blocked the air vent on the dryer and it started burning because it got too hot. Probably because the comforter was too large for your machine. Take it to the laundrymat, use the big machines and wash it. Then dry it for a long time on lower heat. Make sure you dry it very, very, very well or the feathers will mold inside.. When I washed my goose down comforter I used fabric softener. Now it has an odor. What do you recommend? It's probably from condensate because down is very hard to dry. I would leave it out in the sun to hang for as long as possible. I always use very, very little soap and at least one vinegar rinse when doing my down comforters and usually do a second vinegar rinse just to be sure as this is not something that I do very often and mine always smell nice and fresh. One or two cups of vinegar is all that is needed for a full (large or extra large) load. You may have to try doing a couple of rinses to remove this odor (and film) from your comforter. I always begin my drying outside (sunshine) and when partially dry I then start drying in dryer with no heat to begin the fluffing (I use 2 or 3 tennis balls in my dryer) (adding a large dry towel helps this process). Check often to be sure it is not rolled into a ball. After maybe 25 - 30 minutes of fluffing, I remove the comforter and either return to out side or lay it flat over a sofa back to air dry a little more. Later, I return it to the dryer (no heat) to complete the task. Goose down does not always do well with dryer heat and may even leave an odor of its own. This may seem like a long (overdone) process but I have down comforters that are well over 15 years old and still look and smell like new. Fabric Softener  Not recommended because it will coat the down and reduces its fluff. 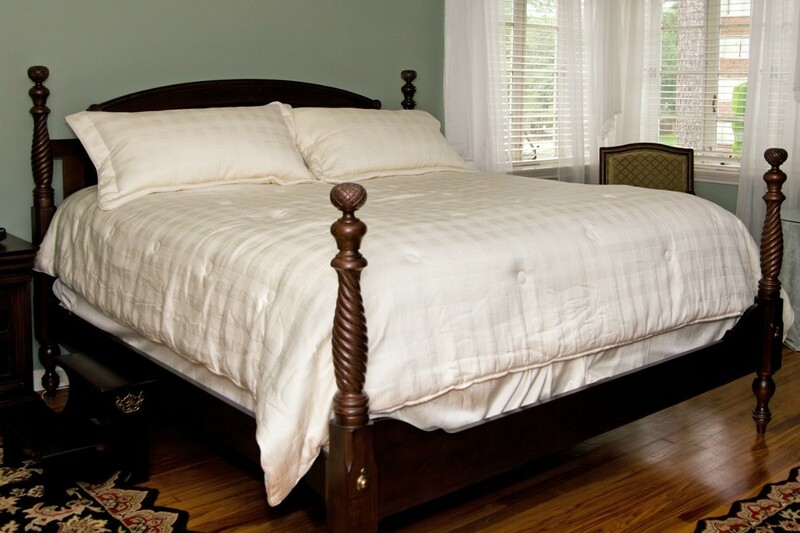 Clumping or Odor  These are signs that your comforter is not dry yet. You want it to be completely dry to prevent mold. I have a beautiful feather and down duvet which we purchased in Germany. I store it in a large vac bag through our Florida summers . How can l get rid of that musty smell after it has been stored for 10 months? I have tried the fluff setting on the tumble dryer to no avail!